I was never any good with kids. Which seems strange considering that I am the eldest amongst all my cousins, on both my mother’s and my father’s side. You would think that I would be besieged with babysitting duties growing up. But for some reason unknown to me, this was not the case. My cousins grew up around me, and it only was when they were a little bit older that I was comfortable around them. Babies did not enthrall me the way they did other girls, who would coo and carry them as if they were born to the task. I took one of my toddler cousins to a children’s party once upon a time and I was so tense (don’t you dare fall off that swing!!) that I had a stiff neck and a stiff drink afterwards. I never held an infant until my own daughter was placed in my arms. I hoped, fingers-crossed and salt-over-the-shoulder, all those nights when little C grew inside of me, that something magical would happen when I gave birth and I would turn into…a mother. A mum. A mama. Someone who knew instinctively what to do. Someone who effortlessly sat her happy and content baby on her hip while spouting things about the benefits of nursing and infant-led-weaning. I wanted to trust all those well meaning, and seemingly more experienced, women who said that it would all come naturally. What did come naturally (and with shocking force) was the complete and absolute (and often irrationally hormonal) love I have for these two little beings. A love so powerful it borders on painful paranoia sometimes. Sometimes I just want to stay home and smell them – that kind of weird love…that if it wasn’t your own kids somebody would be calling for a restraining order. But the other stuff? The mummy stuff? Well, let me be real here. Those most certainly did not come naturally. Apart from little C and H, I am still too nervous to hold an infant. There is still a point in children’s parties when I am in real need of a stiff drink. I am a hopeless mess about playdates and after-school activities and arts and crafts. So little C is relegated to this. Cooking and baking and going to the market. Mixing meatballs and peeling garlic. Sniffing spices and steaming fish. Choosing cherry tomatoes and learning to work the pepper mill. These are our “arts and crafts”. – Make the icing: Place all the icing ingredients in a heatproof bowl over a saucepan of simmering water. Stir until melted and smooth. Watch the heat (keep at moderate) and that the water never touches the bowl (my icing split, but with a little faith, trust, and elbow grease I was able to save it – more on saving the split icing below). Remove from the heat and set aside to cool. When the icing is cool, beat with an electric mixer until thick and fluffy. – While the icing is cooling, get started on the cupcakes: Place the butter and the sugar in the bowl of an electric mixer and then beat until light and creamy. Gradually add the eggs and beat well until combined. – Sift together and add the flour, baking powder, and cocoa to the bowl and beat until combined. Fold through the milk and melted chocolate. – Spoon the batter into a 12 x 1/2 cup capacity, paper-lined muffin tin. – Bake for 20-25 minutes in a pre-heated 160C (320F) oven, or until a skewer inserted comes out clean. Remove and cool on a wire rack. 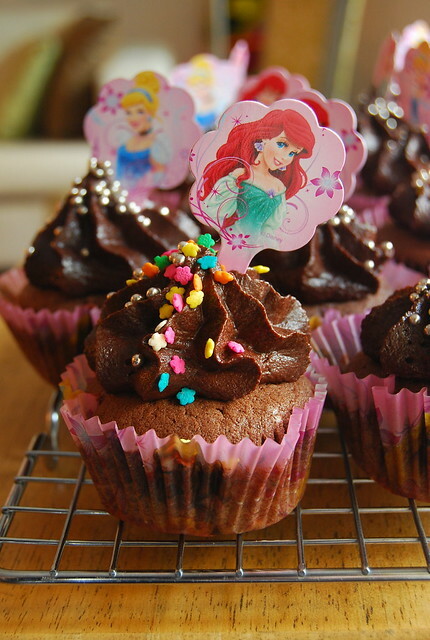 – When the cupcakes are completely cooled, pipe on the icing as you like. Top with sprinkles and toppers and any pretty thing that you or your little one can think of. Little C was very excited about these cupcakes for a lot of reasons. Firstly, she loves to do things in the kitchen, whether it be stuffing a fish or washing dishes. 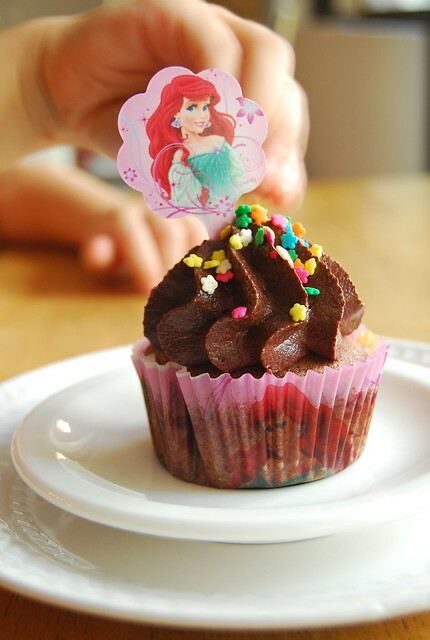 Secondly, she loves chocolate and cupcakes (like most kids). An thirdly, I told her she could put all the sprinkles she wanted, plus these princess cake toppers. She sifted, stirred, and decorated. I also tried to inject a little math when we measured out the milk. All in all not too shabby an endeavour as far as life learnings are concerned. Plus the bonding and camaraderie that licking a pan of melted chocolate brings. Plus we get to eat our handiwork! I don’t think I will ever be one of those effortless mamas who do all the perfect and right things for their children. I’ve resigned myself to the fact that I’m more a fly by the seat of my pants kind of mother…and that’s ok. I have my own mom to consult, and friends who are awesome moms, and mommy-blogs, and Google. So I can say I have a great support network 😉 Other than that, I just do what I think in my heart is best, and try to have fun while doing it…chocolate cupcake-style. What a cute post! The Lord has a good reason He gave you not just one, but two angels. You'll be fine. I hope to try this! Thanks! Little kids would love to taste this. I have too boys and like their mom they love sweets. Hi Iyor! Thank you so much for your sweet words 🙂 You are one of the mums I super admire!! Yes, let's plan soon!